GM's High Performance Vehicle Operations, which created vehicles such as the Chevrolet HHR SS, has been disbanded. DETROIT -- General Motors, focusing on mainstream products in a battle to survive, has scrapped a unit that produced high-performance vehicles. GM today disbanded High Performance Vehicle Operations, which is based at the companys suburban Detroit technical center, and redeployed its engineers, said spokesman Vince Muniga. The unit created low-volume vehicles for GMs divisions designed to appeal to enthusiasts and bolster the companys image. 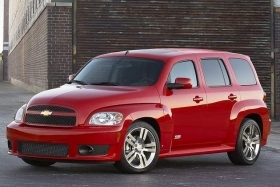 Products included V-series Cadillacs and the Chevrolet Cobalt SS, HHR SS and a V-8 version of the Colorado. Muniga said there are no plans for high-performance versions of upcoming cars.The move is in the spirit of GMs viability plan delivered to the U.S. Treasury Department on Tuesday. In the plan, GM said its future-product focus is on fuel- efficient cars and crossovers. It also pledged to increase its current offering of six hybrids to 14 by 2012 and to 26 by 2014. GM also boosted its request for federal aid by as much as $16.6 billion. The High Performance Vehicle Operations unit could be reinstated once GM regains its financial health, GMs Muniga said.